Perfectly Created Chaos! 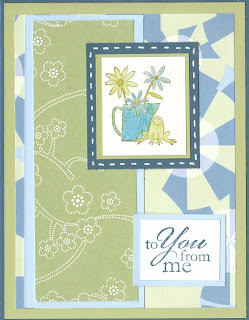 : Froggy card with Appreciation! Good Morning! The card I have to share today is another one that I made based off a sketch I saw in Just Cards. See, I told you you'd be seeing more of these! Nothing super special about this one. I used Not Quite Navy, Celery, Bashful Blue and some watercolor paper along with some scraps of pattern paper to make this one. The image is from SU's "Flower for all Seasons" I chose the one with the frog because, well I could color the frog green obviously, so it worked well with the color palette! I stamped the image with NQ Navy ink on some water color paper and then used my aqua painters to fill it in with some inks and also just pulling color from the lines of the ink. So, now I gotta go take Tyler to the bus stop. I wanted to take a minute though and thank everyone for the kind comments you leave for me each day. They really inspire me to keep creating and sharing. I am glad that so many of you seem to come back regularly and I want you to know that I enjoy seeing all of your blogs as well! Thanks again and have a great day! Beautiful color choices. I love how the dp is so graphic, yet it just sits back and lets your image stand out! cute cute image!! Love the froggy! !